I don't think I have to write an introduction on my obsession with healthy skin anymore :-) These last few years I find myself being 24:7 on the lookout for products that make my skin look more radiant and fresh. And in search for good skincare I know how easy it is to get distracted by the enormous range of very promising serums, moisturizers, masks and oils. 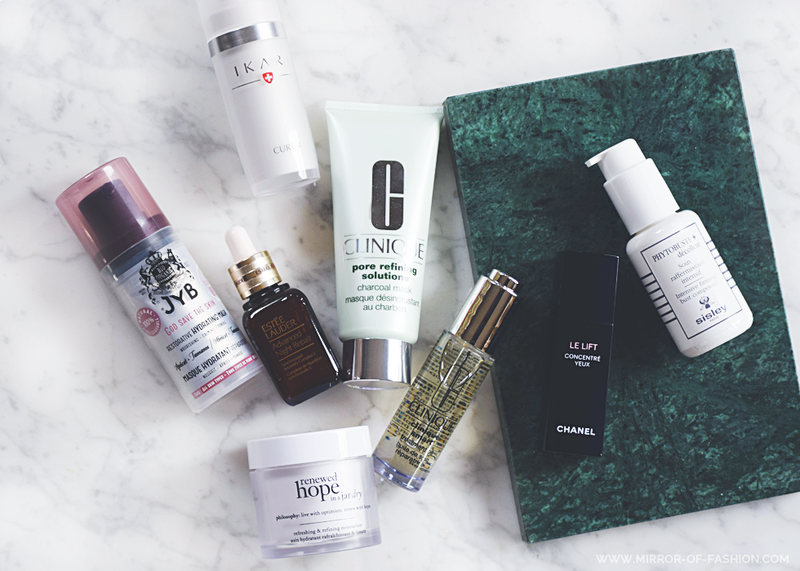 Now, I am well aware of the fact that not all products are as beneficial for your skin as they are for mine but I do wanted to put a spotlight on my current favorites today. They rapidly took over my heart and if you're still looking for your own skinsavers I'd highly recommend giving these a try. A nourishing, calming and toning mask with oils of the Tamanu tree and the apricot and some Jojoba, Vitellaria and Macadamia that make your skin more glowing than you could have imagined it. Luminous the next level! A highly concentrated serum combating wrinkles and lines and regaining elasticity with hyaluronan acid and vitamin A. It had my skin looking visibly more firm after only two weeks of usage. A classic must have on your bathroom shelf. This repairing serum maximizes the renewal of your skin during night and does not only reduce the appearance of wrinkles but also has your skin looking more fresh and even toned. My favorite Philosophy refreshing and refining moisturizer for energetic skin, a finer texture and smaller pores. Ever since I welcomed it to my daily skincare routine my skin feels surprisingly more smooth and comfortable. The one I grab for when my skin is in need of some detoxifying, approximately once a week. Charcoal powder and mineral clays absorb excess oil, tackle impurities and refine enlarged pores like a champ. The most luxurious and beneficial oil I've tried so far. Clinique's newbie contains argan oil and a triple antioxidant to improve your skin's natural capacity to repair. My skin looks far more plumped and nourished. Bye bye fine lines, hello radiance! The eye area always needs extra attention. I prefer Chanel's Le Lift lightweight eye treatment to iron out fine lines and reduce puffiness. Dark circles are somehow covered and as it leaves the under eye area illuminated it makes me feel fresher and younger in just a few secs. Never forget your bust and décolleté! As it often reveals a woman's real age. I pamper it with this firming treatment by Sisley that offers an immediate toning effect while a unique photo-complex helps preserve its firmness.